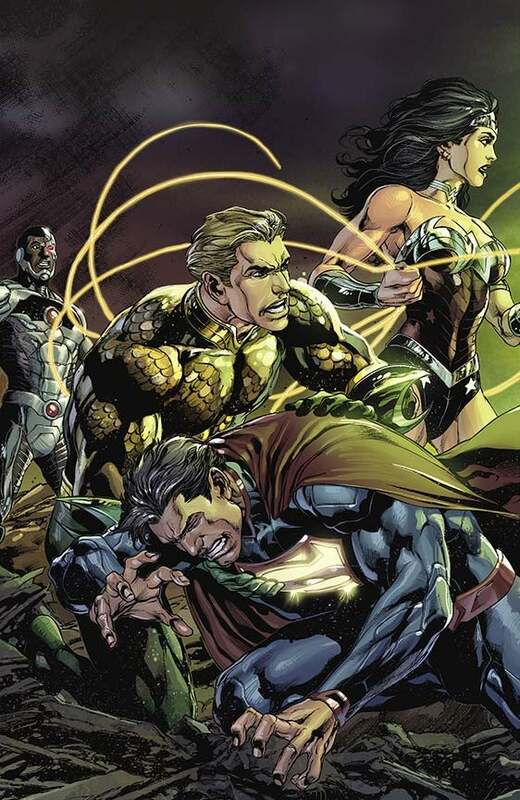 DC Comics's Justice League Group In April: Let's Play Guess The Surprise! So there's a surprise on the other side of a fold-out cover that we haven't yet seen for each of DC's April New 52 releases. What could those surprises be? Nobody knows...but it could be fun to guess, right? Right! And so we shall! We're not going to guess at all 52 of them, mind you--only the ones where we think we could have some semi-legitimate input, even if it's purely speculative. Which of them? Well, since there looks to be a whip involved, we're guessing Catwoman, who doesn't appear on the cover of this issue but who has appeared on the front of the first two issues. I've also heard someplace that she's prone to toggling back and forth between being a good guy and a bad guy. That said, she's got her own, ongoing book and unless that's going to be cancelled it's hard to picture her going the Secret Society of Super-Villains route. So...am I wrong? Or is it just mind control/impersonation/some other kind of dupe? Show of hands, everybody: Who says it's Batman? Okay, that's one, two, three...all of you. Everybody's pretty sure it's Batman. Incidentally - is this the first time we've seen Krypton used in the "present day," as opposed to in Action Comics flashbacks, since the launch of the New 52? • The Dead King takes the throne as the true king of Atlantis—but who will be the first to kneel before him? 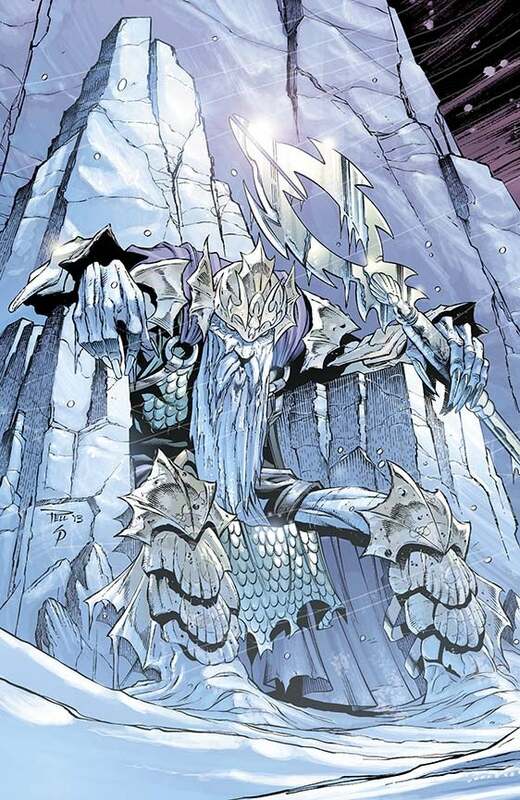 Can we put money down on Ocean Master or Mera? Somebody who isn't Aquaman, but who would be a real game-changer if they were working with/for or worshiping at the altar of the bad guy? It'll be disappointing if it's just Aquaman; that won't be a very dramatically interesting "surprise" cover, since ultimately you know the hero of the book won't kneel before anyone for too long and since the whole "groveling hero" image is a pretty common one to begin with. Take a look at that red lightning on the far right edge of the image. 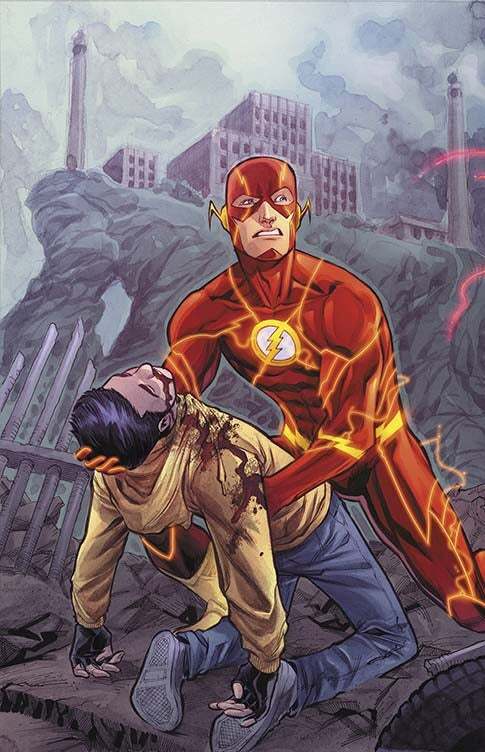 It seems likely we're looking at the emergence of the Reverse Flash in the New 52. 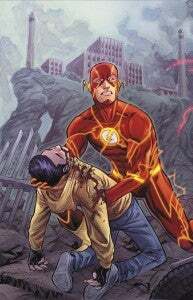 Barry all covered in yellow lightning that's always moving even when he's not? We'll have the reverse, a yellow costume with red lightning. The character was originally announced to debut in #17 in February but so far the solicitations don't seem to bear that out. 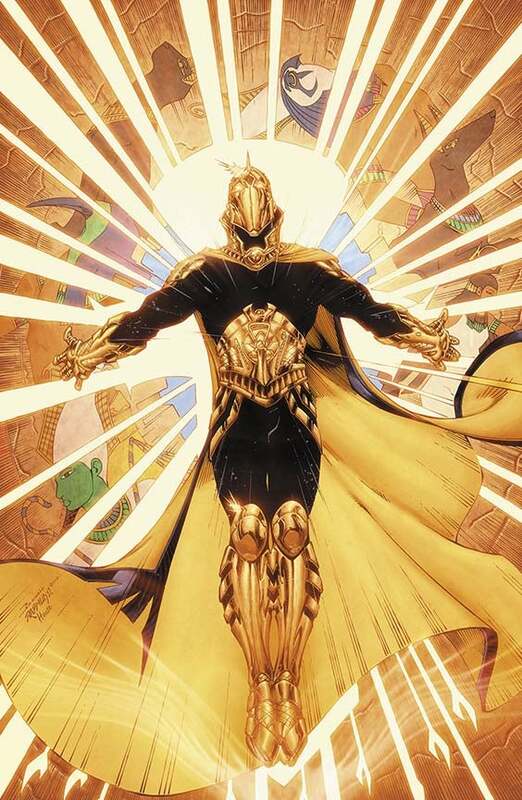 As we've stated elsewhere, there's a number of possibilities here, and the obvous one might seem to be Booster Gold, since he's already appeared in the New 52 and he's expected to play a big role in some of Geoff Johns's upcoming plans. That said, the most LIKELY one but not the guy I'd like to see, is Beowulf, whose sword that seems to resemble and who has already appeared in the New 52--as a backup feature in Sword of Sorcery by the same creative team who's doing this issue. I'd LIKE to see either Booster or Kamandi, but I don't think that'll happen. Why not Booster? 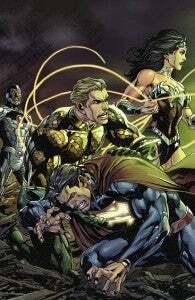 Well, it seemed at the time as though Geoff Johns orchestrated the cancellation of Justice League International in no small part so that he could cannibalize the cast for other projects. It's hard to imagine him going to all of that trouble and then just handing Booster off to somebody else before he ever got to use him. It's a toughie, for sure. 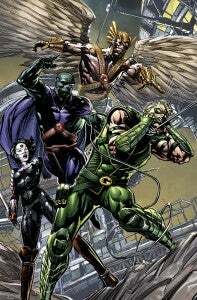 More JSA members would be my guess--probably somebody like Wildcat, Starman, whoever. But the Egyptian stuff is really screaming for a Blue Beetle or Black Adam. Maybe the S!H!A!Z!A!M! kids from Flashpoint? 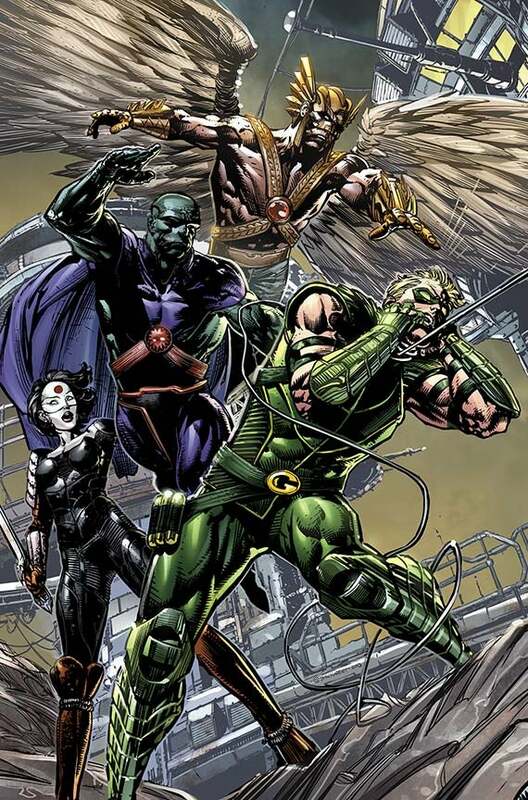 Wouldn't it be cool, and a little weird, if we got Dan Garrett in Earth 2? 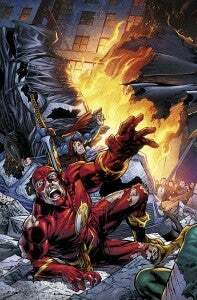 Then when Multiversity hits, we could have a different Blue Beetle on three different worlds in the Multiverse! My guess? It's the Michael Holt of Earth 2, who's now shanghaied here in an ironic twist. And that the other half of the gatefold will bear that out by featuring a second Mr. Terrific looking on, none-too-pleased that his other self is making time with his girl.